The MEMORIAD® term is a global brand name and derived from the English words "memory" , "mental math" and "olympiad" and it means "Memory, Mental Calculation & Photographic Reading Olympiad". 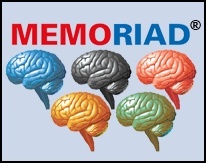 MEMORIAD, where games and competitions are held in the olympic games order once every four year, is the FIRST and ONLY platform combining "MEMORY", "MENTAL CALCULATION", "MENTAL ARITHMETIC" and "PHOTOGRAPHIC READING" competitions. Memoriadtm was registered in the 148 countries of the world in 2006. This is the first international mental olympics which started to give money prizes (started in 2008) to winners besides titles, medals and cups. Memoriad platform is NOT an organization held for an individual’s or corporation’s product promotions. Each national Memoriad chairperson, as a member of international Memoriad committee, has the equal vote power in decision making of the Memoriad. The decision of "in which world city that the international Memoriad will be held once every four years" will be made by the international Memoriad comittee. Memoriad brand is now under the registration of Memoriad Ltd. and when the dream of national Memoriad games are known globally comes true, this brand will be transferred to the incorporated body of the International Memoriad Committee.